Water sports in Bali are activities that are quite attractive to tourists, both domestic and foreign. In addition to watersport activities on Tanjung Benoa Beach, several rivers in Bali have also been developed into attractive tourist attractions. Just name a few of them are Ayung River, Telaga Waja River, Melangit River, Pakerisan River, Penet River, Petanu River, and Badung River. However, in fact not all of these rivers can be developed into tourist attractions, especially rafting adventure tours. So far, there are only three rivers that are suitable for use as rafting sites, namely: Ayung River, Telaga Waja, and Melangit. 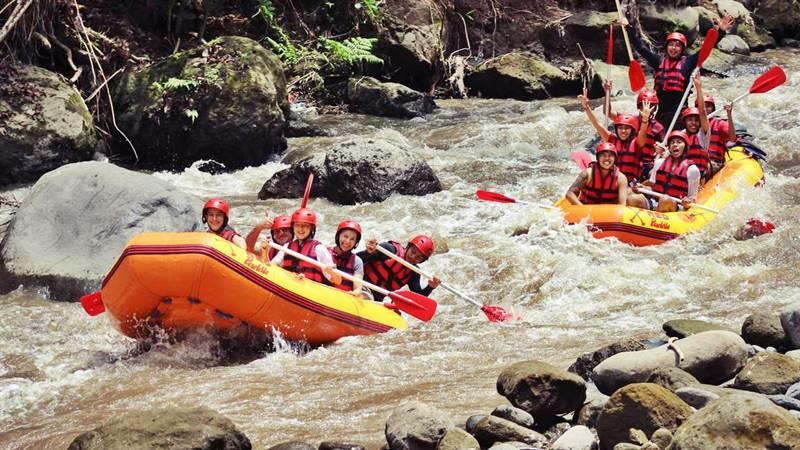 In this page, we will review the Ayung River in Ubud as one of the most favorite rafting activities in Bali. The Ayung River is Bali Island’s longest river, and the second is Telaga Waja. It’s approximately 68.5 km away from upstream to downstream. It begins on the north side of the island of Bali from the mountain. The river passes through Bangli, Gianyar, Badung and Sanur Beach. A medium flow is found in the river surrounding natural rainforest. There is also great waterfall on one side. This river is almost year-round safe for rafting activity. Not only that, the Ayung river has a close relationship with the Balinese residents, especially rural communities. The majority of the rural resident works as a farmer, making the river important. The residents are respectful of the river by keeping it clean and green plants surround it. This is why the river looks so beautiful and natural. 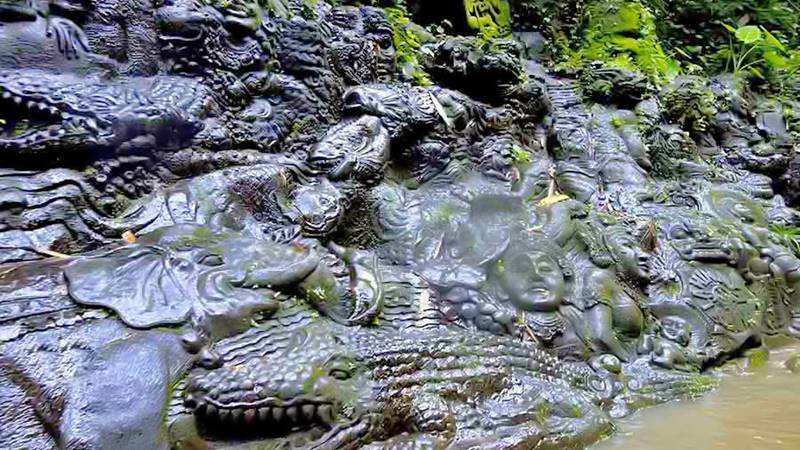 In addition, the attraction of this river is the story of Ramayana carvings (reliefs) along the river wall, about 1 km. Seeing the relief invites you to feel wonderful. Well, if you want to take a rafting trip on the Ayung River, where is the exact location. The center of the rafting activity is in the Ubud area, Gianyar Regency, Bali, precisely in the village of Payangan. Of course you are already familiar with Ubud. Ubud was known for a long time as the heart of Balinese traditional arts and culture, as well as its natural beauty, farming, ancient history, traditional art market, and monkey forest. Visiting with yourself or family, Ubud is a tourist attraction that promises all kinds of activities within a short distance! When you visit the village of Ubud, rafting become an alternative tourism choice. Ubud is green highland located on the south-east side of the island of Bali. The easiest way to get there from Ubud is from Sanur, Nusa Dua, Jimbaran and Kuta. And the distance between Kuta Beach and the village of Ubud is around 35 kilometres. Nearly 1-15 hours driving time, therefore. In addition, it is situated approximately 5 kilometers away from Ubud village. Now of course it is very easy to find a location or tourist spot by just looking at it from the Google Map apps via your smartphone. Class V: “Violent Rapids” really gets your adrenaline pump and often needs to be transported. Which classification belongs to the Ayung river? The rapid class of this river of Ubud is class II to III which is suitable for beginners. Also, very easy to reach and ideal for those who never try rafting. It therefore regarded rafting in Bali as a familiar whitewater river. The water flow in Ayung River is not so hard, but this river is rocky in many parts. You will feel the rise and fall, you will beat rock and you will turn round. Truly feel the fresh water and even get wet. You don’t have to wait a good season for those who want to go Bali rafting in Ubud. It is suitable for rafting all year round due to the water of Ayung river. It also offers half day rafting, which is available throughout the year, morning or afternoon. 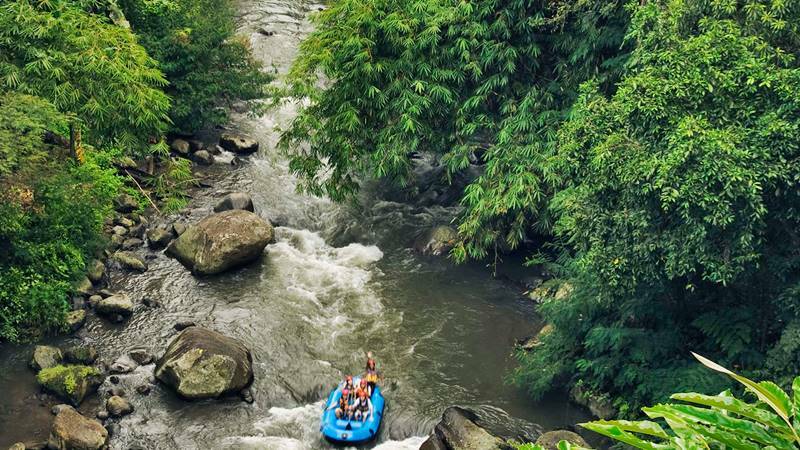 In addition, Ayung River Ubud is home to a large number of white water rafting operators / companies. Most of them offer Ayung whitewater rafting price differences. The Ayung rafting prices of each rafting company most often reflect the services offered to customer by the whitewater rafting company. The higher the Ayung rafting price, the higher the quality of their property. For example, shower facility, toilet, changing room, lobby and food choices. Even though there are many rafting companies on the Ayung Whitewater River, we only work with three rafting companies in the Ayung Whitewater River Ubud on BaliRaftingAdventure.com. This enables us to focus on the great experience of our clients by selecting Ayung Rafting’s top three rafting companies covering all budgets. Therefore, we can ensure that you get the best adventure rafting experience in Bali. The rafting operators from the Ayung River who cooperate with us are: Bali Red Paddle Rafting + Graffiti Rafting Adventure and Pertiwi Rafting Adventure. 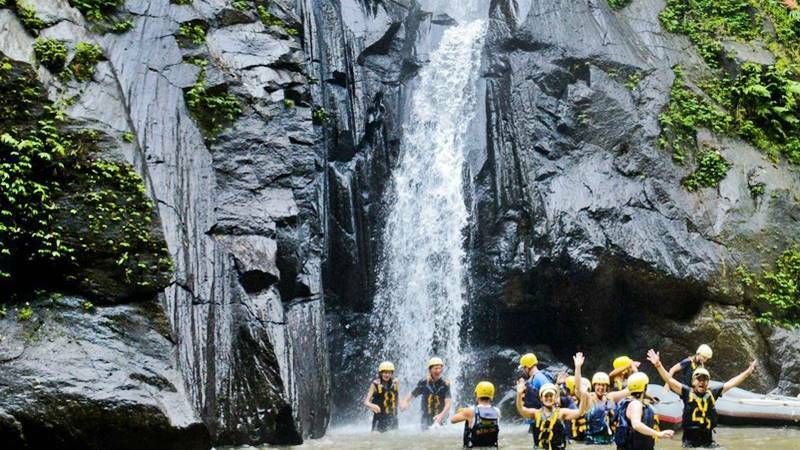 Let’s participate in an exciting rafting trip along the Ayung River in Ubud.